The year is coming to an end, but behind the scenes we’ve been working hard to bring you new features and improvements for AWR Cloud. I won’t beat around the bush, as I’m sure you’re curious to see what new functionalities you can enjoy. On this release, we focused on two major aspects of SEOs daily work: speed and filtering deep data. We know how important it is to be able to deliver fast results. Not only when it comes to existing clients, but also for new leads who expect an initial evaluation before deciding if they are going to work with you. AWR Cloud’s new option for on-demand updates is great for pitches, as it delivers fresh ranking positions in no more than one hour. And the best part is they’re not cached results served from research databases – the results are actually retrieved live, directly from the search engines that you are targeting. • Create a new project targeting the domain allrecipes.com (make sure you set it to on-demand frequency at this point, so the system doesn’t start the standard initial update). Now that the project is created, you can go to the Websites list and request the 1 Hour run. Once the update is completed, you can send a Quick Report with the current ranking positions and make your proposal. This new type of update comes with a maximum of 1,000 keyword units that can be used every 24 hours, and is available starting with the Agency package. 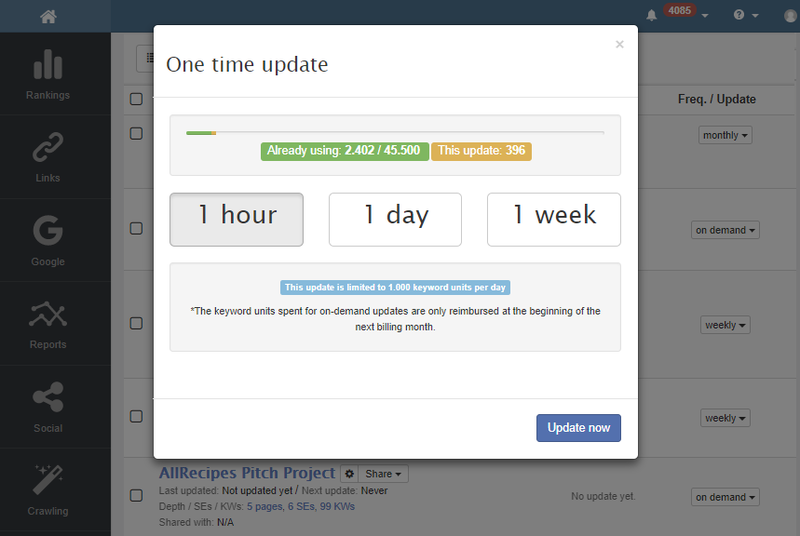 This type of on-demand update gives you the possibility to fetch fresh rankings with a 1 day turnaround. It is best used for refreshing a project after you add new keywords / search engines, or after you roll out on-page changes. The new levels of allowance apply to Custom Enterprise plans, as a 5% quota of the resources available. 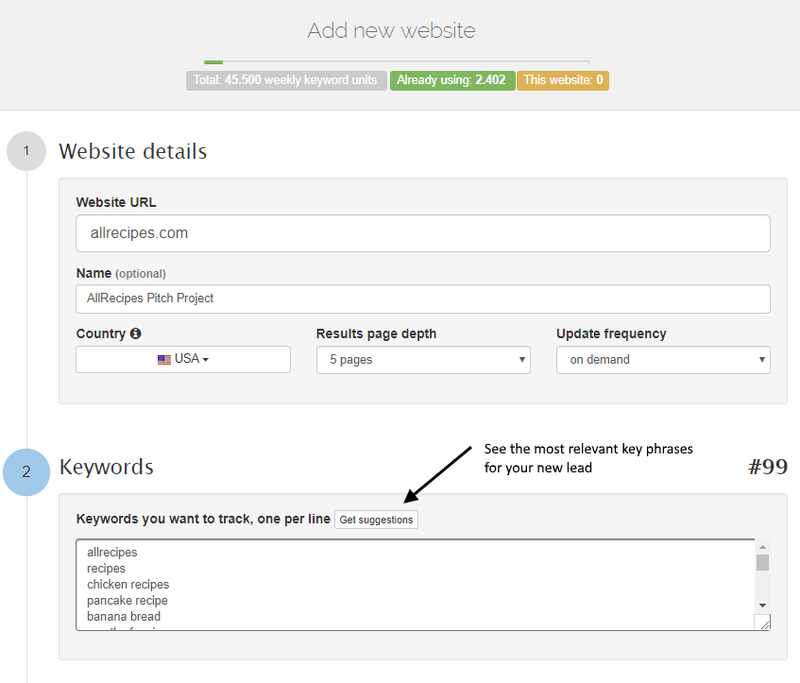 For example, with a plan of 200,000 keyword units, you can assign 10,000 units for type of update during each 24 hours. The face of Google Mobile results has gone through several makeovers since last year, as the search engine changed the design of different types of results and introduced new ones. During this time, our engineers were busy updating support for the various types of results that are available for mobile search tracking. To help you get a better understanding of the exposure that different types of content offer for your site and your competitors, we added a new Filter by Result Types for Google Mobile. 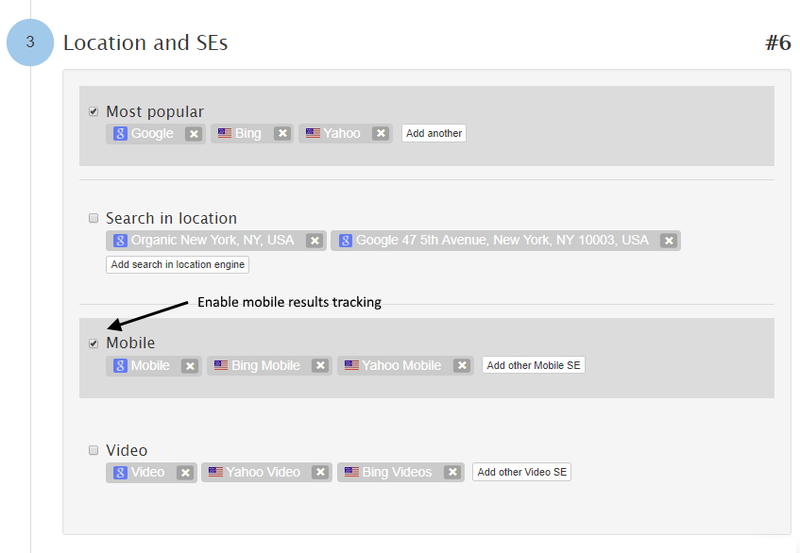 This helps identify the specific terms where Google lists your site with Video content on a blended search page. 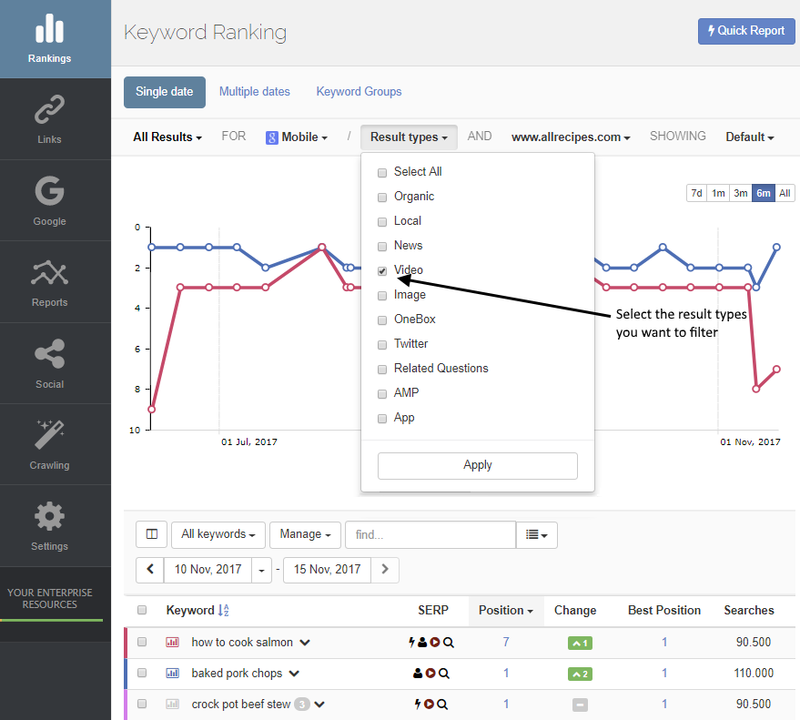 In this example, the red icons mark the results that belong to allrecipes.com, and the black icons mark other type of results that belong to competitors in the SERP. If you want to see the keywords that your competitors rank with for Video content, simply change the website for which data is displayed in this view. Note: this filter is also available for the Google Universal search engine, which is dedicated to desktop results in AWR Cloud. Some of the types of results captured by the Universal search engine include: Organic, Local, Local Knowledge, Features Snippet (OneBox), Video and Images. As you can see, we’ve worked on improving update times and options, so whether you’re preparing to pitch a prospective client or need some quick data for flash decisions, AWR Cloud can accommodate your needs. In light of Google’s repeated announcements of switching to a mobile-first index, we’ve also prepared a new filter that makes it easier for you to track your keyword positions. In terms of data filtering by results, it’d be interesting to learn what factors influence your search preferences choice for tracking only the traditional organic results, or universal results. Feel free to comment in the section below. Congrats to the team, for both the release and this sales pitch business case post. Makes the 1h on demand update very attractive.